Its coming to that time of the year now where I prefer a nice relaxing bath over a quick shower, along with a nice candle and my favourite face mask. For me; a bath is all about un-winding and de-stressing so I tend to opt for something with nice calming scents to help me drift off easier at night. If you're a regular reader you'll know I've become quite a fan of anything Lavender scented, so I was absolutely delighted when I got the chance to try this Arran Aromatics Lavender and Black Pepper Mineral Soak. This is from their Feel Good Formulas line which does exactly what it says. For the Last week I have had a pretty horrible cold, my muscles ached, I found it hard to breath as I was all blocked up and sleeping at night was tough...you all know what its like. Then I started running myself nightly baths with this Arran Aromatics Mineral soak and blimey did it help no end - it couldn't have turned up at a better time to be honest!. I think the packaging is lovely, simple-yet-effective. Its going to look chic in all bathrooms as it's so neutral. its a plastic jar with an air tight lid to keep all that freshness locked in - plus once its all gone you can reuse it for things like cotton pads...I know what a genius right haha. The Purpose of this Mineral soak, is to help relax you and warm up aching muscles the natural way. It cleanses and heals with exfoliating sea salt while its packed with beautiful lavender essential oils and black pepper. Once you flip open the lid the smell of Lavender hits you, its pretty strong and I think the black pepper inside it gives it that bit more of a kick, so if you love Lavender scents like me you'll really enjoy this. They are rather chunky bits of rock salts along with bits of black pepper and dried lavender, all I do is sprinkle in a small hand full while my bath is running and it instantly dissolves leaving teeny bits of the dried lavender floating around - so its not going to block your plug don't worry. 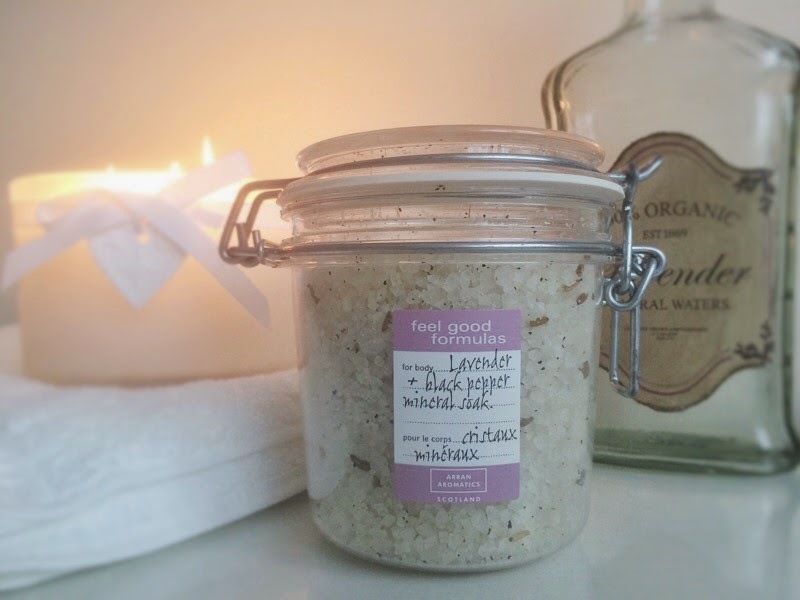 This bath soak is going to give your skin a good detox as-well-as leaving it refreshed and glowing; all thanks to the special blend of healing minerals and sea salt. Once your in the tub with this you just feel so relaxed and tranquil.. if I'm being honest it's hard not to drift of there and then- I'm not really one to fall asleep in the bath either. The scent this creates in your bathroom is just beautiful, I could smell it even with a cold..it really helped me breath better, relaxed my aching muscles and get a much better nights sleep- ah the power of Lavender. I have also given a bit of this to my Nan to try as she has problems with aching legs bless her, so when I asked her the other day about what she thought. She said it was very soothing and really helped to relax her muscles, she also thought the scent was beautiful. So I think I shall be treating my Nan to her own jar very soon. This jar has been like my medicine, and has seriously helped me feel so much better. I really recommend this if you are feeling a bit under the weather, are a regular gym go-er and suffer with achy muscles or find it hard to sleep at night and just simply want to relax - this little jar will sort you out no problem. Thanks for helping my stinker of a cold with your magical jar of mineral soak Arran Aromatics! I can see this being a must have. Have you tried anything from Arran Aromatics? Is this something you fancy trying? I'd love to hear your thoughts. Bath season is well and truly here! I love a bit of lavender too. I do love Arran Aromatics, so I bet this is lovely! I am rubbish with baths though, much more of a shower girl! This looks so relaxing, and the price isn't expensive at all! I've never tried anything from Arran Aromatics but I've only heard great things! This sounds soooo good! Hope your feeling better now love.